Nearly a century before Mondrian made geometrical red, yellow, and blue lines famous, 19th-century mathematician Oliver Byrne employed the color scheme for his 1847 edition of Euclid's mathematical and geometric treatise Elements. Byrne's idea was to use color to make learning easier and "diffuse permanent knowledge." The result has been described as one of the oddest and most beautiful books of the 19th century. The facsimile of Byrne's vivid publication is now available as part of TASCHEN'S Bibliotheca Universalis series. 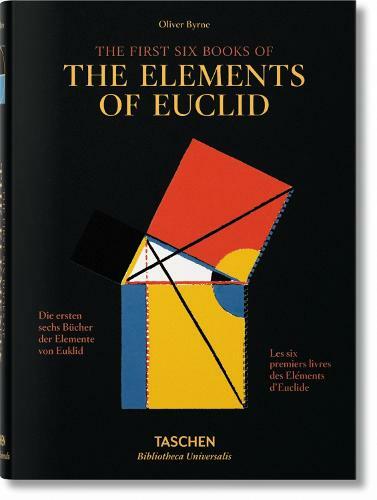 A masterwork of art and science, it is as beautiful in the boldness of its red, yellow, and blue figures and diagrams as it is in the mathematical precision of its theories. In the simplicity of forms and colors, the pages anticipate the vigor of De Stijl and Bauhaus design. In making complex information at once accessible and aesthetically engaging, this work is a forerunner to the information graphics that today define much of our data consumption.